Citation: C N Trueman "The Battle of the Bulge"
The Battle of the Bulge, fought over the winter months of 1944 – 1945, was the last major Nazi offensive against the Allies in World War Two. The battle was a last ditch attempt by Hitler to split the Allies in two in their drive towards Germany and destroy their ability to supply themselves. Hitler’s plan was to launch a massive attack using three armies on the Allies which would, in his mind, destabilise their accord and also take the huge port of Antwerp through which a great deal of supplies was reaching the Allies.The Battle of the Bulge started on December 16th 1944. Hitler had convinced himself that the alliance between Britain, France and America in the western sector of Europe was not strong and that a major attack and defeat would break up the alliance. Therefore, he ordered a massive attack against what were primarily American forces. The attack is strictly known as the Ardennes Offensive but because the initial attack by the Germans created a bulge in the Allied front line, it has become more commonly known as the Battle of the Bulge. The Fifth Panzer Army, led by Manteuffel, was to attack the centre of the American forces, capture the strategic road and rail centre of St Vith and then drive on to Brussels. The Seventh Army, led by Brandenberger, was to attack in the southern flank, as designated by Hitler, and to create a buffer zone to prevent American reinforcements from attacking the Fifth Panzer Army. The Fifteenth Army was to be held in reserve to counter any Allied attack when they took place. Hitler believed that his forces would be able to surround and cut off Canada’s First Army, America’s First and Ninth Armies and Britain’s Second Army. On paper, it was a seemingly absurd plan – especially as Germany had been in retreat since D-Day, her military was depleted of supplies and was facing the awesome might of the Allies. However, Hitler, as commander-in-chief of the military, decreed that the attack should take place. The battle started with a two hour bombardment of the Allies lines that was followed by a huge armoured attack with the majority of the German armoured might based at the Schnee Eifel. The Germans experienced great success to start with. Why was this? The Allies were surprised by the attack. They had received little intelligence that such an attack would take place. Before the attack started, English speaking German soldiers dressed in American uniforms went behind the lines of the Allies and caused havoc by spreading misinformation, changing road signs and cutting telephone lines. Those who were caught were shot after a court martial. The weather was also in Hitler’s favour. Low cloud and fog meant that the superior air force of the Allies could not be used – especially the tank-busting Typhoons of the RAF or Mustang fighters from the USAAF which would have been used against the German tanks. Though the weather was typical for the Ardennes in winter, the ground was hard enough for military vehicles to cross and this suited the armoured attack Hitler envisaged. However, the success of the Germans lasted just two days. Despite punching a bulge into the Allies front line, the Germans could not capitalise on this. The Germans had based their attack on a massive armoured onslaught. However, such an attack required fuel to maintain it and the Germans simply did not possess such quantities of fuel. By December 22nd, the weather started to clear, thus allowing the Allies to bring their air power into force and on the following day, the Americans started a counter-attack against the Germans. On Christmas Eve, the Allies experienced the first ever attack by jet bombers. Sixteen German Me-262’s attacked rail yards in an attempt to upset the ability of the Allies to supply themselves. However, without fuel for their armoured vehicles, any success in the air was meaningless. The Germans had advanced 60 miles in two days but from December 18th on, they were in a position of stalemate. The fighting was ferocious. The New Year’s period was a time of particularly intensive fighting as the Germans attempted to start a second front in Holland. This time in the Ardennes coincided with a period of intense cold and rain and the soldiers on the ground faced very difficult conditions. Trench foot was a common problem for infantrymen, as was exposure. 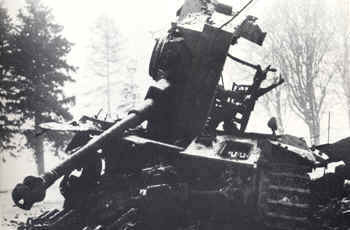 By mid-January 1945, the effect of lack of fuel was becoming evident as the Germans had to simply abandon their vehicles. The 1st SS Panzer Division, led by Lieutenant-Colonel Joachim Peiper, had to make their way back to Germany on foot. This was the unit that was responsible for the Malmédy Massacre. The Battle of the Bulge was the largest battle fought by the Americans in World War Two. 600,000 American troops were involved in the battle. The Americans lost 81,000 men while the Germans lost 100,000 killed, wounded and captured. Also, Hitler’s plan that a successful attack would split the Allies was also based on false hope. If anything, such an attack helped to engender a greater feeling of kinship with one consolidated aim – to defeat Nazi Germany.